Unloading 7,500 pounds of steel which will become two car lifts. The best thing I ever did was hiring these two guys to install the lifts. They delivered the goods and unloaded it, which would have been a huge job by myself. 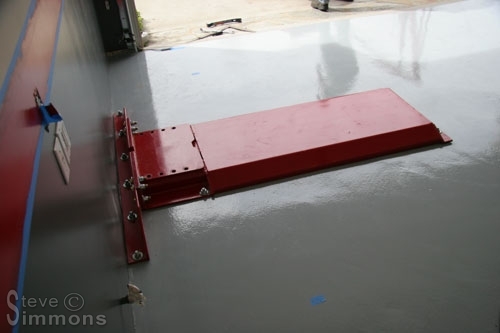 Their knowledge of this type of lift was also invaluable as we performed the installation. Twelve bolts hold the base of the lift to the floor. 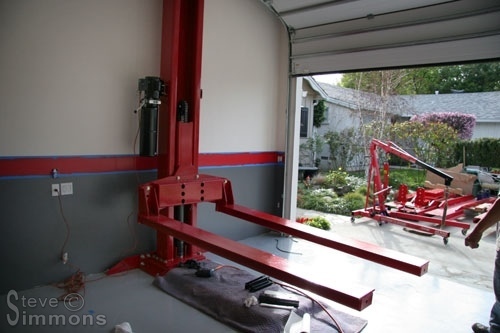 Technically the lift will stand on its own even with a car sitting upon it, but the bolts are good insurance. We also live in earthquake country so not using all the safety devices available would be foolish! This photo shows the column bolted onto the base and the cross arm attached to it. The hydraulic pump is mounted to the side of the column but not yet filled with fluid. 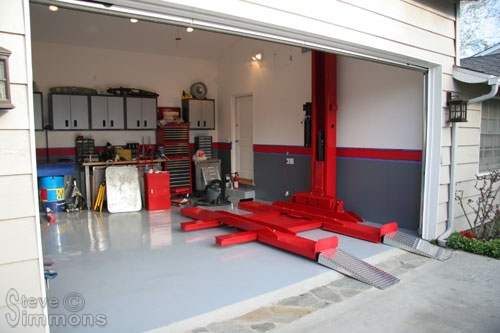 The measuring you see taking place is to make sure we got it right, because being off as much as two inches in placement would spell disaster for whatever car was on top when the garage door opened. 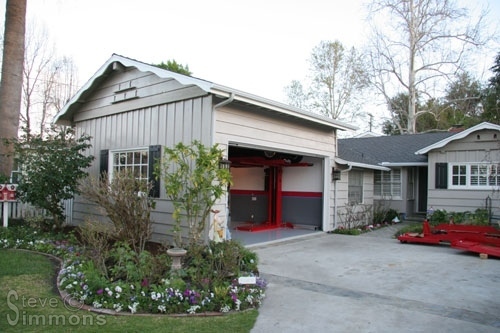 I spent many hours in Corel drawing the plans which call for precise placement of every object in the garage. We were within an inch of perfect, so all is well. Attaching the “heavier than they look” arms. These will need to be cut down shorter eventually because they are designed to hold vehicles up to 9,000 pounds and I have no cars that big! As they are, the two lifts will hit each other unless the arms are shortened. The factory was willing to shorten the arms for me but I decided it was best to measure and cut in place. I should have had them do it because this is some really thick, heavy and wide steel! A portaband saw was called into action to do the cutting. Installing the tracks was straight forward enough. They were custom made smaller than normal, taking three feet off the standard length and six inches off the width. They are just barely large enough to hold a modern mid-sized sedan. In hindsight it would have been nice to leave an extra inch or two of width on each one. My concern was maximum under-body access and that was actually achieved. 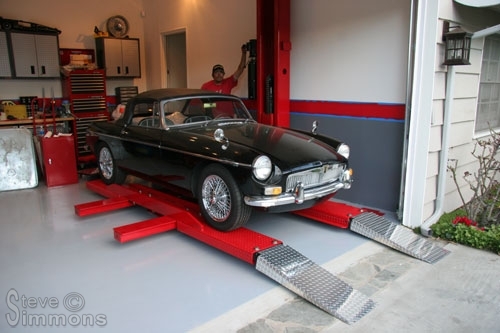 The ’65 MGB will get the honor of the first ride, even though the real first ride was one of the installers himself. I figured he would survive the fall better than my car, should the worst case scenario occur. We have lift off! The MGB is on its way up. The wife cheers and the installers wipe the sweat from their brows. I watch nervously, hoping we bled the hydraulics properly. A thing of beauty. 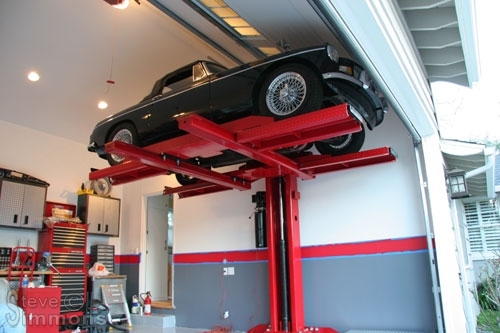 The MGB sits over seven feet in the air! 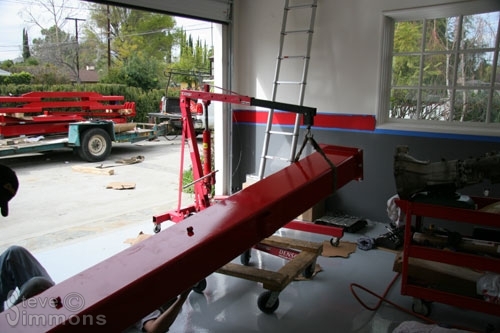 The original design of the lift placed the bottom edge of the ramps right at eyebrow level. Not only did I consider this unsafe, but it would also make the garage feel smaller. The columns were therefore custom made taller than standard by approximately 18-inches. This view shows how “up and out of the way” a car is when it’s raised all the way up on the lift. From the street, you can’t even tell there is a car in the air. Mission accomplished! 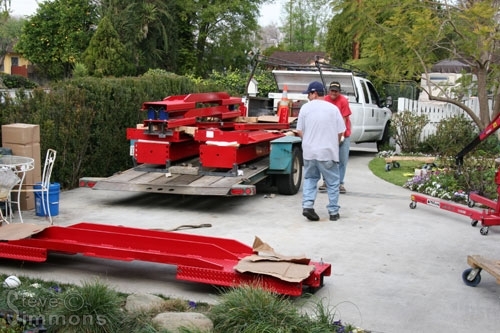 The second lift still sits in the driveway but it will wait for another day. The first one took an entire afternoon to get erected and we’re all tired. 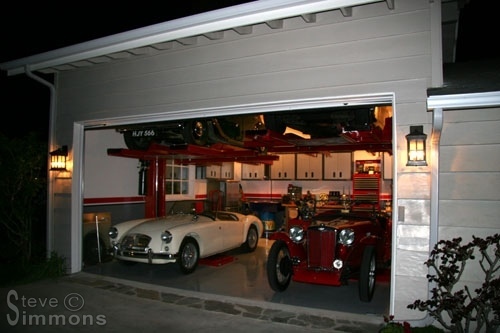 The ’58 MGA bravely sits under the B. 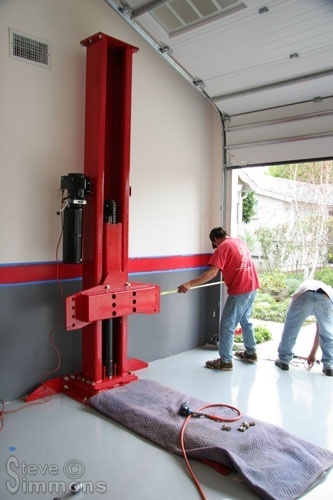 The second lift is moved into the garage and will be installed soon. 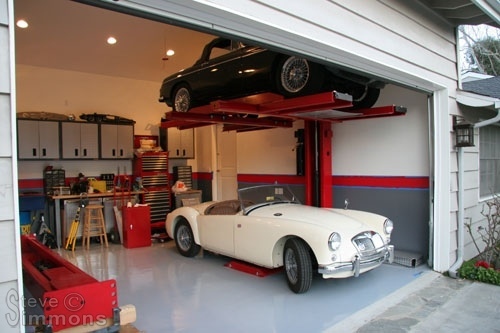 The bottom car has to drive over the base of the lift, which isn’t a problem but it’s a slight annoyance. Originally I planned to recess the base into the concrete but feared making a mistake on the measurements. If this happened it would be a catastrophic error and the floor would have to be poured again at great cost. In hindsight I should have gone for it because the measurements were all perfect. Darn! The second lift is installed and another car raised. The MGB is now trapped on the first lift because as you can see, the arms of the lifts are overlapping one another. 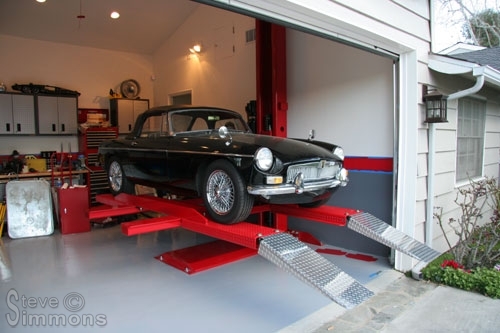 The first lift cannot be lowered enough to get the MGB off of it! I cut the arms soon after this photo was taken and now all is well.